Homme is a popular perfume by Costume National for men and was released in 2009. The scent is spicy-sweet. The longevity is above-average. It is being marketed by Beauty San. The cloves, cinnamon & sandalwood is so strong in this one. Like really strong, my female co-workers liked it. But the guys, not so much. Anyway, it's a very manly fragrance, that you can wear this anywhere...But be careful when you wear this. This IMHO is a fragrance you should wear during the fall, winter & early and I mean early days of spring. This is not the fragrance you should be wearing during hot times. I used four sprays...both wrist, front of my neck and front of my shirt. Will I buy this again?...No? Can you use it as a unisex scent? NO! Should You Skip It, Sample It First or Blind Buy It? I say Sample it first. Longevity: 5/5 (Sixteen hours plus). Creativity: 3/5 (Spicy, citrus, earthy). Projection: 5/5 (Two hours plus, but longer during warmer temps). Friendly and intriguing. Instant love! Okay, so it's not often that I encounter a fragrance and love instantly... but for me, Cousume National Homme was one of those fragrances. I love spice. I love cinnamon, I love cloves, and I love sandalwood. This fragrance is full of these three. It opens with a grapefruit & bergamot combo which is juicy but surrounded by pepper and dry spices. Also cardamom, which is a note I really love. After a while I get a dried fruit and subtle vanilla, very beautiful. I think that it sits well on skin and blends with body chemistry beautifully. Overall, this is kinda what I wanted Dolce & Gabbana - The One for men to be. This is like a niche version of that (to me at least). I am a huge fan of warm fragrances with spice and everything nice. I love this and all other types of warm oriental spicy fragrances (Chanel Egoïste, Must de Cartier, Ambre Narguilé). I think this is one which is inviting, unusual and rich. It doesn't hold back. This fragrance suits my personality well I think. A fragrance which makes people want to come closer to you. I really cannot recommend this one enough. But I think you must like warm, rich spices to like this. A great fragrance! Bought if after smelling it just once.. This is an older review and consists of two reviews added together. I apologize for the lengthy review but I believe this fragrance is worth the attention I'm giving it. When I first read about this perfume I really wanted to try it. Soon after that I tried Zirh's Ikon, which I liked except for one note. It gave it a strange vibe, making it unwearable to me. Somehow I thought it may have been the cloves, which scared me a bit to try this fragrance. Yesterday though I sampled this for the first time. Man, was I surprised! I really liked it, rom the fresh citrussy opening to the heartnotes where you are greeted by cloves and cinnamon. The cloves are clearly present but it's not as if you're dipped into a jar of cloves. They blend really well with the cinnamon actually. It's a very warm, spicy scent. The only thing I had some mixed feelings about was the base that revealed itself after 5 or 6 hours. It's longevity is amazing, I applied it to my wrist at around 6 PM, even washed my hands a few times with water, but when I took a shower this morning at around 11:30 AM, I could still smell it on my wrist. Usually my skin tends to eat fragrances a little bit, but I was really impressed. This perfume may not be a real crowdpleaser, but I think a lot of people would like this particular fragrance. Then again, taste will always be personal. It most certainly got my attention and I will definitely try this again, maybe even buy a small bottle for winter. The first spray, here goes.. BOOM! It hits you right in the face! I couldn't really pick up on any citrus notes but the cardamom was REALLY apparant. But, only for about 20-30 seconds, after that it starts to settle in. The cloves come through and a few minutes later they're joined by cinnamon. It's soft and warm, very comforting. I used to hate cloves as a child, my mother had a small jar of cloves in the bathroom, along with some potpourri. I could never stand the smell of it, it was so loud and present. But this perfume? Nothing like that. The cloves give CNH its depth, but it's not the main character at the heart of this beautiful perfume. Cinnamon plays the lead role, but is greatly supported by the cloves to create a smoky or balmy feel. After the heart notes have faded, I am left with a warm resinous smell that comes from the labdanum and is supported by the sandalwood. Slightly sweet, but only slightly. My initial impression stays, this is a wonderful perfume. Even for those that don't like cloves, like me, this can be perfectly accesible. The comparison to Comme des Garçons is one that I can understand, especially during the first few minutes. But this perfume is a lot softer and much less pungent than CDG, which was more medicinal and heavy. I find CNH more versatile and more crowd friendly. It kind of reminds me of the holidays, don't know why though, but it does. As I already experienced the first time I tried this, this things lasts and lasts and lasts! And sillage, powerful. But not overpowering or intrusive because it's bit of a soft scent. It can get heavy if you smell it up close right off the skin, but the sillage trail this leaves is very soft and warm. A few words of advice though, be easy on the sprayer. If you overspray this, it may get really intrusive and overpowering. I've already been through a bottle of Costume National Homme, indeed this is the fragrance that made a Dominique Ropion fan out of me. Needless to say when the opportunity arose of once again purchasing it from an online discounter (it's becoming harder and harder to find), I jumped at the chance. Costume National Homme reminds me a little of Neela Vermeire's Trayee, but in a more honest and structurally minimal way. In a side by side test the similarities are undeniable, probably having something to do with the Clove/Cardamom/Cinnamon accord present in both and also the inclusion of Patchouli and Sandalwood. The difference is that Trayee eventually leans more toward the bitter end of the scale, while Costume National Homme is quite gourmand in its sweetness. The notes here conspire to produce a 'honeyed tobacco' sort of feeling ... like cherry pipe tobacco without the cherries :) ... strange, I know, but completely gratifying. The incensy vibe from the Labdanum is great as CNH approaches dry down with the sweetened herbs and spices still playing their song in the background. Projection and longevity here are absolutely stellar! In fact, this would be the deciding factor if I had to choose between CNH and the aforementioned Trayee. Fortunately I don't have to, as I love both of them equally! M. Ropion is a genius imho. 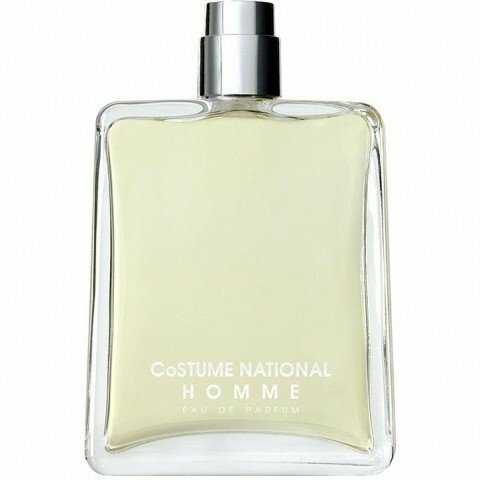 Costume National Homme is one of those fragrances that is slowly disappearing from the marketplace, which is a rather sad state of affairs. A few backup bottles of this are in order, I think. It's just marvelous!! Costume National Homme opens with a extremely brief and subtle shot of grapefruit and bergamot before the warm heart notes of cardamom and cinnamon spice melding with tobacco-like clove arrive. The early heart notes are quickly joined by a remarkable plum-like labdanum from the base which adds further depth to the already strong cinnamon and tobacco-like clove combination. Sandalwood and patchouli also from the base add just a slight bit of sweetness to the composition, but the clove, cinnamon and labdanum are the star players during the scent's relatively linear development. Projection and longevity are outstanding. As soon as I saw Dominique Ropion as the parfumier of Costume National Homme I developed high expectations for the composition and I am happy to report that he has even exceeded those! This is a beautiful spicy composition using the cinnamon and cardamom and clove extremely well, and the plum-like labdanum fits in perfectly with the spice creating one of the deepest, smoothest tobacco-like accords I have sniffed to date. The closest scent I can think of to this one is Clive Christian X for Men (a scent currently in my Top 10), but Costume National Homme is lacking the strong jasmine present in that one, instead featuring its smooth tobacco-like bent. What Costume National Homme is also lacking is 90 percent of X for Men's cost, while still smelling 90+ percent as good and exceeding in the projection department. I would highly recommend this one regardless of cost, but the value here is absolutely outstanding at its $60 or less street price for a 100 ml edp bottle and should be noted accordingly. Costume National Homme is another outstanding composition by Ropion and earns a near-masterpiece rating of 4.5 stars out of 5 if not higher. Costume National Homme is rather divine. Something that I, a woman, could happily douse myself in. When I first sprayed Costume National Homme I found it quite strong and nauseating. There was a little too much of everything all at once. It smelt like a thick, resinous forest with runny, liquified honey. After this scent settles however the scent is intoxicating, in a good way. It's like a gourmand for men. Rich, syrupy, spicy and earthy. Full of sensuality and intrigue. Costume National Homme seems to have a prominent tobacco note, which is further complimented by patchouli, herbs, cinnamon and vanilla. It's a masculine scent with a sweet and syrupy finish. In my opinion, Costume National Homme works well on both men and women alike. I recommend this fragrance not only for its beautiful complexity and sexiness, but also for its undeniable lasting strength and strong sillage.